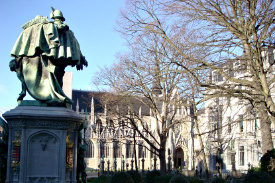 Brussels's Upper Town is the historical seat of power of the rulers of Brabant, the Southern Netherlands, then Belgium. This is where the Royal Palace, Parliament and modern ministries are all located. Most of the neighbourhood was designed by the Austrians in the Neoclassical style in 18th century. It is probably the most beautiful part of Brussels outside the Grand Place. You can shop for antiques at the Grand Sablon, stroll around the world-class Fine Arts Museum, gape at the monumental Law Courts building, visit the sumptuous Royal Palace, tour the elegant Belgian Parliament, or marvel at the Art Nouveau architecture in Ravenstein Street. Set aside at least two days to explore this neighbourhood in detail. Located immediately east and south-east of the Central Station, the Royal Park (officially known as the Park of Brussels) has been the seat of Brussels' ruling elite since the Middle Ages. This is where you will find the Royal Palace, the Belgian Federal Parliament, the Belgian Prime Ministers' office, and the headquarters of the former Société Générale de Belgique (now BNP-Paribas-Fortis). The Royal Park is often the venue for concerts, spectacles and other events. It is the only major park located within the historical city walls, now defined by the Inner Ring Road. 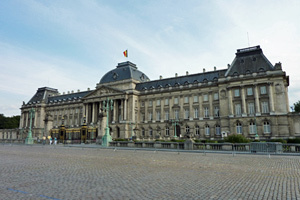 The two chambers of the Belgian Parliament are housed in the Palace of the Nation, at the northern extremity of the park. It was designed by Barnabé Guimard in 1783 to accommodate the Council of Brabant. Its style reflects that of the New Palace, at the other end of the park, which would become the Royal Palace. The Royal Palace (Palais Royal) occupies the southern end of the park. 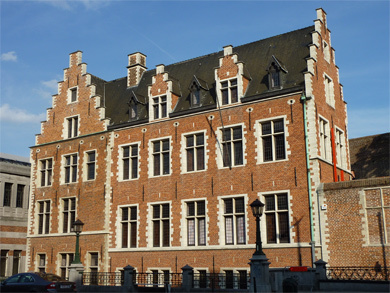 It was originally the site of the Coudenberg Palace, the residence of the Dukes of Brabant since the 11th century. Improved and enlarged over the centuries, Coudenberg grew into one of Europe's largest and most prestigious palaces in the Renaissance, under the auspices of the powerful Habsburgs. The palace was destroyed by a fire in 1731. Prince Charles Alexander of Lorraine, Governor of the Austrian Netherlands, had it replaced by a classical edifice, which was completed in 1775. Claimed by the Belgian monarchy in 1831, the new palace was modified and extended by King Leopold II around the turn of the 19th and 20th centuries. The main façade is longer than that of London's Buckingham Palace. The interior is lavishly decorated. Greek columns compete with the marble panels and gilded decorations. The collection of antiques and paintings is worth of some of the greatest museums. Although it is still the official residence of the Royal family, the King and Queen now live at the (even larger !) Royal Estate of Laeken, near the suburb of Heysel. The Royal Palace is open to visitors from late July to mid September from Tuesday to Sunday 10:30am to 4:30pm. Admission is free. It is definitely one of the most impressive sight in Brussels, so do not miss it if you are in Brussels during this period. The Dynasty Museum (open Tue-Sun 10am to 6pm, until 5pm from October to March), housed in the elegant Hôtel Bellevue next to the Royal Palace, retraces the history of the Belgian Royal family. Royal Square (Place Royale) unfolds along the western edge of the Royal Palace, with the temple-like neoclassical Church of Saint James-on-Coudenberg (Eglise Saint Jacques-sur-Coudenberg) abutting the palace. A statue of Godfrey of Bouillon, leader of the First Crusade, reminds passersby of Belgium's role as a unifying force inside Europe since medieval times. 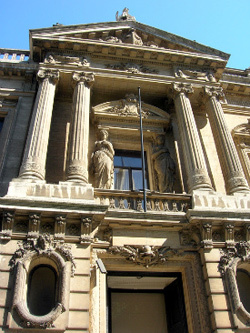 The Royal Museums of Fine Arts are probably Belgium's most compelling art museum. It features paintings by Flemish Renaissance and Baroque masters such as Bruegel the Elder or Rubens, and Belgian Surrealists like Magritte or Ensor. Regency Street (Rue de la Regence), expanding south of Royal Square towards the Sablons and Poelaert Square. Note the handsome white neo-classical Belgian Court of Accounts building, opposite the Fine Arts Museums. 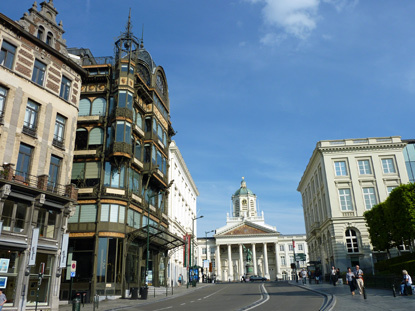 Halfway through Regency Street, the twin squares of Greater Sablon & Lesser Sablon (Grand Sablon & Petit Sablon) are possibly the city's best known squares after the Grand Place. Dividing the two squares, the Church of Our Lady of Sablon stands out with its richly ornated 15th-century Gothic architecture. The church was originally founded as a chapel by the guild of the archers in the 13th century. The Lesser Sablon is dotted of a beguiling little garden adorned with 48 bronze statues representing Brussels' traditional crafts and trades. In the middle stands a monument to the Counts of Egmont and Horn, who were decapitated on the Grand Place by the Spaniards for criticising the abuses of the Spanish Inquisition. Their execution helped spark the national uprising that eventually led to the independence of the northern provinces of the Netherlands (see History). Beethoven, whose paternal family hailed from the Brussels region, wrote his Egmont Overture in the memory the Flemish nobleman. The Lesser Sablon is enclosed on its eastern side by the majestic Egmont Palace. It was built between 1548 and 1560 by the afore-mentioned Count of Egmont and his mother, Françoise of Luxembourg. Originally designed in Flemish Gothic style, it was later adapted to the Renaissance tastes, then radically altered to the classical palace that can be seen today. In the 18th century, the palace passed by marriage to the powerful House of Arenberg, a German princely and ducal family, who have since elected residence in Belgium. 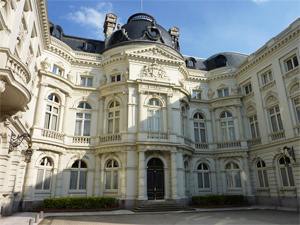 Egmont Palace is now home to the Belgian Ministry of Foreign Affairs and off-limits to visitors. 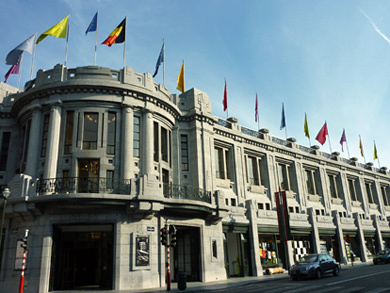 The Greater Sablon is Belgium's premier location for antiques shopping. It holds a (rather pricey) antique flea market every weekend that attracts crowds from well beyond Belgium's borders. Many of the 17th and 18th-century townhouses on the square and in the nearby streets are antique shops of their own, specialising in upmarket and luxury goods. Other buildings on the Greater Sablon are mostly chic restaurants and chocolate markers (including Wittamer, Pierre Marcolini, Neuhaus, Godiva and Leonidas). 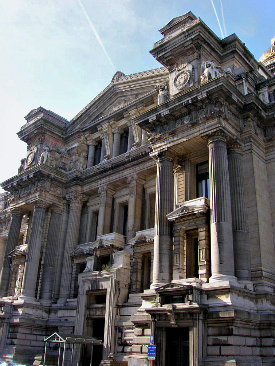 The colossal Law Courts of Brussels (a.k.a. 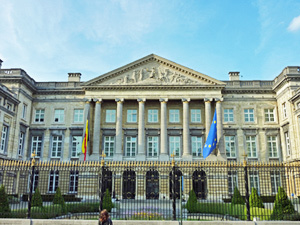 Brussels Palace of Justice, or Palais de Justice in French), on Poelaert Square, dominates the Sablon and Marolles neighbourhoods. This staggering edifice is one of King Leopold II's most extravagant projects. It was erected on what is known as Gallows Hill, where Brussels' gallows once stood. It was designed in the fashion of ancient Egyptian temples with the purpose to inspire awe. In fact, with its 26,000 m2 (280,000 sq ft) of built area, it is larger than St. Peter's in Rome (21,000 m2), and is one of the largest pre-20th century edifices in the world. The Law Courts were built between 1866 and 1883. Its architect, Joseph Poelaert, died during the construction in 1879. Some people say his sudden death was due to witchcraft used by the working-class residents of the Marolles who had been evicted. Note the "SPQB" signs around the edifice, mimicking the ancient Roman "SPQR" (Senatus Populusque Romanus), the "B" obviously standing for "Brussels". Just north of the Park of Brussels, locked between Rue Royale, Rue de la Loi and the Little Ring Road, is the so-called Liberty Quarter (Quartier des Libertés). Named in commemoration of the independence of Belgium in 1830, the heights of the Belgian Revolution still resonate in such street names as Rue du Gouvernment Provisoire or Place des Barricades. This is also where French writer Victor Hugo lived during his 5 years of exile in Brussels. This is one of Brussels' most pleasant neighbourhoods. Its streets have a distinct Parisian feel, and are remarkably quiet for the city centre. At its heart lies the Royal Circus (Cirque Royal), a popular venue for musicals, operettas, stand-up comedies and other spectacles. Other concerts and exhibitions are held at Le Botanique inside Brussels' Botanic Garden, just across the boulevards from the Metro Station of the same name (see Entertainment). 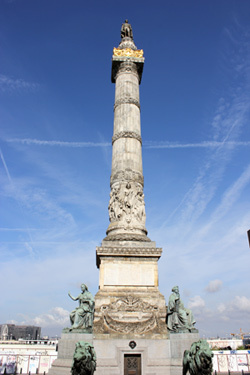 Apart from the Belgian Parliament and several major ministries, a good reason to come here is for the proud 47m-high Congress Column (Colonne du Congrès), the tallest column of the kind in Europe (in comparison, the Vendôme Column in Paris is 44 m high, and Nelson's Column in London rises to 46 m). 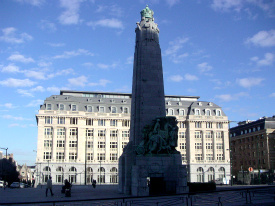 It was erected between 1850 and 1859 by architect Poelaert (see 'Law Courts of Brussels' above) in commemoration of the National Congress of 1831 proclaiming the Belgian Constitution. On top of the column, a statue of King Leopold I dominates Congress Square (Place du Congrès ) and its neoclassical façades reminding of northern Italian palazzi. An eternal flame burns at the base of the column for the lost lives of the two World Wars. Given fair weather (always uncertain in this part of the world), the square commands one of the city's rare panoramic views, with the gothic spire of the Town Hall rising above the roofs of the historical centre, and the dome of the Basilica of Koekelberg, 4km away. The highest viewpoint in Brussels (from the sea level) is the recently renovated Madou Tower (120m, 33 floors), occupied by the European Commission (see EU district). 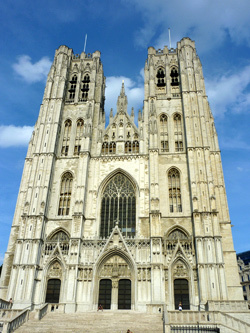 Between Congress Square and the Central Station stands the gothic St. Michael and Gudula Cathedral, facing the National Bank of Belgium. The cathedral traces back its roots to the 9th century, when it was just a chapel dedicated to archangel St Michael (Brussels' patron saint). 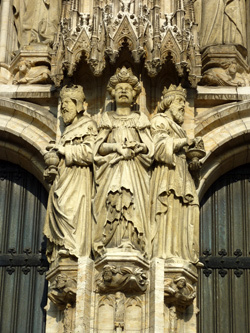 Relics of Saint Gudula were added in 1047 by Lambert II, Count of Leuven, and the new "St. Michael and Gudula" was promoted to the rank of collegiate church. The present structure mostly dates from the 13th century (choir) and 15th century (facade). It was only elevated to an archiepiscopal cathedral in 1962, and is now often used for catholic ceremonies of national interest, such as royal marriages and state funerals. Running from the Central Train Station to Royal Square, Ravenstein Street possesses two of Brussels' most famous Art Nouveau buildings, Victor Horta's Centre for Fine Arts (Palais des Beaux-Arts) and the Old England Building. The former was completed in 1928 and includes exhibition and conference rooms, a movie theatre and a concert hall, which is the home venue of the National Orchestra of Belgium. The centre operates under the brand name Bozar. The Old England opened in 1899 as a department store. It has housed the Musical Instrument Museum since 2000. The museum exhibits some 1,500 instruments from various historical periods.